The company credit card remains a popular option for managing business expenses. But is relying on company plastic still a good idea? In this post, we'll take a look at some of the downsides of company credit cards, as well as checking out some of the alternative options available. The company credit card is a standard way to let employees pay for a wide range of work-related expenses: train or plane tickets, restaurant bills, hotel stays, office supplies - whatever they need to do their work. But are credit cards really the best payment method for employees? It can be hard to keep a close eye on payments until after the end of the month, and nobody feels all that comfortable passing this valuable piece of plastic around the office. At first glance, the company credit card represents a satisfactory solution for CFOs and managers when it comes to managing business expenses. Employees entrusted with the card know perfectly well how to use it, since it's just like their personal credit card. It has the added bonus of cash flow flexibility, since the card is not debited until 28, 30 or even 70 days after purchase. With a company credit card, a monthly expense statement is usually sent to the cardholder, to the company CFO and to the manager. The company can keep track of who is spending how much and on what, but only after the fact. 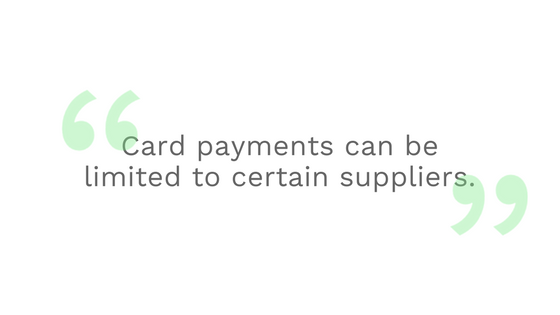 Card payments can also be limited to certain suppliers through an agreement between the bank and the company. This can be a good way to control costs. A final advantage is that banks offer a convenient range of associated services such as travel insurance, coverage for rental vehicles, legal support, medical assistance, or even rapid refunds in the event of fraudulent transactions. All of these features make company cards seem like a good option at first glance. However, they are not the smartest or most agile payment method currently available. Though banks offer a number of handy features, credit cards feature limited verification steps, and spending can be a challenge to monitor. There's so much paperwork involved in using a company card that keeping track of receipts can literally become a nightmare. This isn't just a nightmare for the employee who has to turn into an accountant each month; spare a thought for the poor souls in the finance team who have to run around collecting receipts and supporting documents. And that's assuming employees have actually managed to hold onto them! There are tools out there to help free you from some of these hassles. But the result is still that the finance team and management end up wasting time figuring out who spent how much each month, checking that these purchases were legitimate, and following up on any missing information. 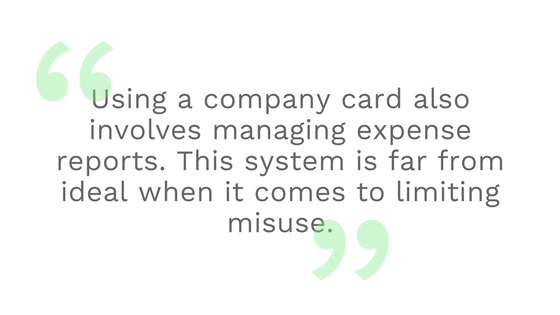 Using a company card essentially involves managing expense reports. This system is far from ideal when it comes to limiting misuse and controlling spending. Not only is this expensive and time-consuming for companies; it also exposes them to the risk of credit card fraud. Another major inconvenience are the web interfaces for managing company cards. These are often clunky and hard to use, and feature limited integration with accounting software. In many cases, certain processes - for example, changing card limits - cannot be done directly online. This means someone has to call the bank every time a spending limit needs to be raised or lowered. This is impractical and time-consuming, since banks take time to reply and tend not to process requests quickly. Lastly, receiving credit card statements in pdf format at the end of the month doesn't allow the finance team to export payments into their accounting software. This can make it hard to analyse the figures, and limits the oversight of company expenditure. The company card does have certain advantages. But it's not suitable for young, dynamic companies or rapidly growing SMEs looking for tools that combine flexibility, security and automation. Instead, it's worth looking at prepaid expense cards. These can be issued directly to the employees or teams that need them. But unlike a credit card, which is essentially managed by your bank, you control the funds available to the user. This allows for clear oversight at any point of the month. If you have traveling salespeople, you can issue them a fixed per diem with the available spend refreshing each day. If you have a marketing team with an advertising budget, you can set that limit weekly or monthly depending on what works best for you. Prepaid cards also feature instantaneous verification, meaning employees can request same-time authorisation for particular expenses. This provides flexibility and convenience for employees, while also maintaining security for management. And if your teams need to extend their limit, they just ask ask for authorisation from their manager or finance team. This means no more time spent calling the bank. Taking prepaid cards even further, virtual credit cards let employees make online payments without needing a physical card at all. With virtual credit cards, employees generate unique numbers for specific online purchases, meaning there's no need to pass the plastic all over the office. With virtual credit cards, recurring online payments can be automated, meaning one less thing to think about each month. What's more, receipts are automatically captured and reconciled against expense categories, providing for quick and easy oversight. And there's a security benefit too. Since individual virtual cards are created for each payment, card details are non-transferable. This helps keep your details secure, and essentially reduces the possibility of credit card fraud to zero. And if one of your virtual cards gets compromised (or maxes out), only one payment is interrupted. If you have dozens of monthly subscription payments, this means you can avoid the nightmare that would normally come with a cancelled credit card. Let's face it: the company credit card is still a popular option for startups and growing businesses. But when it comes to managing office and employee expenses with convenience and security, there are far better options available. One of these is Spendesk, which combines flexible, secure payment methods and integrated expense management software into one clever package. It's free to get started, so why not take a look?